Happy 3rd of July!! Might as well be a holiday, right? It’s actually my first day on-call which is definitely terrifying, but it’s nice that we have the 4th off so I have a day to recuperate. Unfortunately I won’t be enjoying the holiday on the beach somewhere, but I will be passing my pager off at 7AM so I guess that’s something to celebrate! I thought this week would be perfect to share these beachy cupcakes for those of you who are getting away for the holiday weekend. I made these for a friend’s sister’s shower (making shower cupcakes has become a thing of mine I guess – check out these and these too!) who got married in Puerto Rico overlooking the ocean. 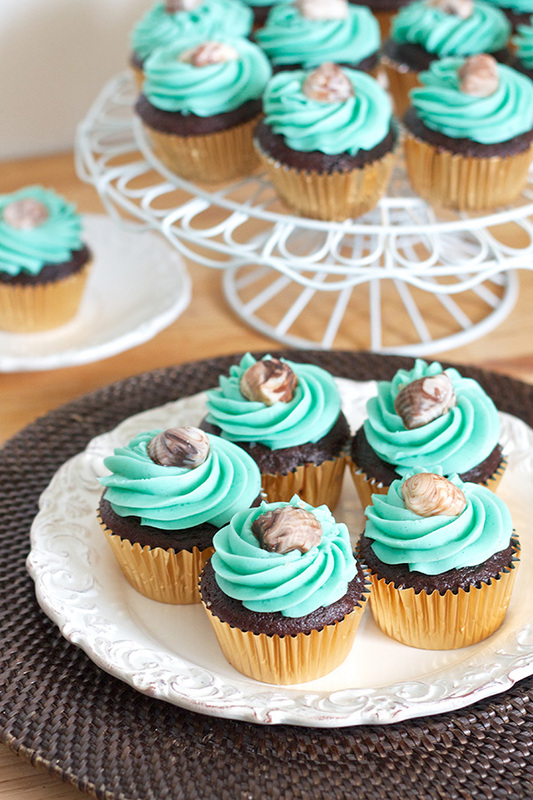 The requests were simple – chocolate cupcakes with aqua-tinted vanilla frosting and chocolate shell decorations. The simplicity forced me work on perfecting some cupcakes basics and I am really excited to share my new go-to vanilla buttercream and chocolate cupcakes with you today! For vanilla frosting I’ve always stuck to the traditional American buttercream that’s really sweet and familiar to most of us. But I must admit that sometimes I can find this frosting too sweet when piled high atop cupcakes, so when I came across Annie’s recipe for whipped vanilla buttercream that claimed to be lighter, I knew I had to try it. Granted the recipe calls for almost the same amount of sugar as my traditional buttercream, the fact that it’s whipped with heavy cream allows more air to be incorporated, increasing the volume of the frosting which spreads out the sweetness a bit. 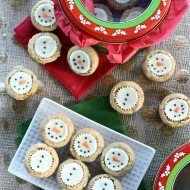 I loved the texture and the intense vanilla flavor from the vanilla bean and vanilla extract! And as for the chocolate cupcakes, I swear by this other chocolate cake recipe for cakes, and I’ve even used it for cupcakes before, but I never really loved how unevenly the tops baked up. 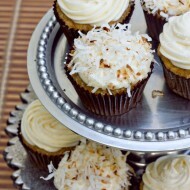 So I tried a new recipe made specifically for cupcakes, and I was so excited to see pretty domed tops on each cupcake. Plus the taste and texture were incredible so I’m very happy to have this recipe in my repertoire now. 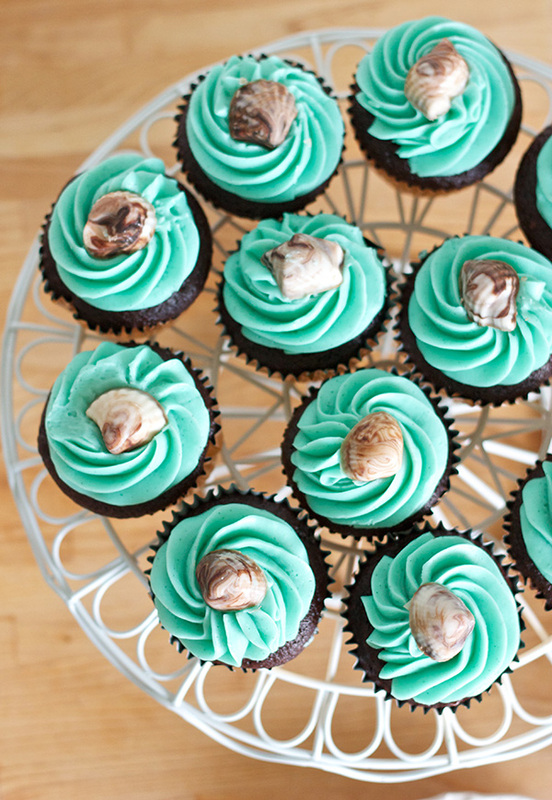 Okay and now a word on my favorite part of these cupcakes – the shells! I followed a technique by Marion of Sweetopia and the results are incredibly lifelike. I made the shells ahead of time and had them in a tupperware in the fridge, and Ryan had to do a double take because he thought they were real shells! They’re made out of a mixture of white and dark chocolate that’s layered into a squeeze bottle and poured into plastic shell molds (I used this one). I think they made perfect accents for this beach-themed shower and they’d also be great for any seaside gathering this summer. I hope you have a fun and safe holiday weekend – minimal dental emergencies pretty please!! - Preheat the oven to 350 degrees and line muffin tins with 24 paper liners. 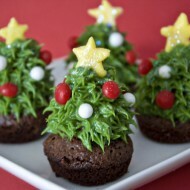 - In a small bowl combine the cocoa powder, espresso powder, and hot water and whisk until smooth. 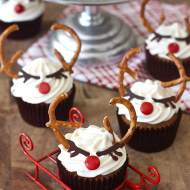 - In a medium bowl whisk together the flour, baking soda, baking powder, and salt. Set aside. 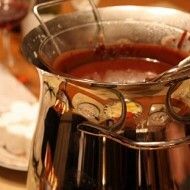 - In a medium saucepan over medium heat, melt the butter and sugar until smooth, stirring occasionally. Transfer the mixture to the bowl of an electric mixer and beat on medium-low speed until cool, about 4-5 minutes. Add the eggs one at a time, mixing well after each additional. Add the vanilla and then the cocoa mixture until smooth. - With the mixer on low, slowly add the flour mixture in 3 additions, alternating with the sour cream – beginning and ending with the dry ingredients. Mix until just incorporated. 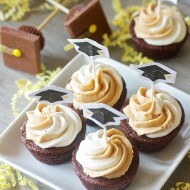 - Divide the batter evenly among the prepared liners and bake 18-20 minutes, or until cake tester comes out clean. Rotate the pans halfway through baking. Allow the cupcakes to cool in the pans for 5 minutes, then transfer to a wire rack to cool completely. - In the bowl of an electric mixer fitted with a whisk attachment, whip the butter on medium-high speed until smooth. Add the confectioners’ sugar and mix on medium-low until incorporated. - Scrape the seeds of the vanilla bean into the bowl and add the salt. Beat again on medium-high speed until smooth, about 2-3 minutes. - Mix in the heavy cream and vanilla extract and beat until just incorporated. Then, increase the mixer speed to high and whip until light and fluffy, scraping down the bowl as necessary, for about 5 minutes. 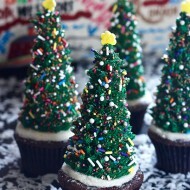 - Transfer frosting to a decorating bag fit with a large star tip and pipe swirls on each cooled cupcake. - In separate containers, melt the white chocolate and semi-sweet chocolate until smooth. I prefer to do this in the microwave by heating the chocolate in 30 second intervals, mixing vigorously between each interval until completely melted. - Transfer the chocolate to a squeeze bottle or large Ziploc bag with the corner snipped off in layers, alternating between layers of white and semi-sweet chocolate. - Fill up the molds, scrape them so they’re al filled evenly, and transfer to the freezer for 5-10 minutes until the chocolate is set. Remove chocolates from the mold and continue making shells until you’ve got 24! Top each cupcake with a chocolate shell. These are beautiful! I love the shells! These look absolutely beautiful. I’m so impressed that you made your own chocolate shells. I definitely would have just bought praline shells and called it a day. Amazing! Wow, they look fantastic! Making a lighter frosting was a great idea. 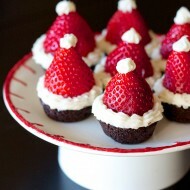 I’m sure that the cupcakes are very delicious, but decoration is really gorgeous. 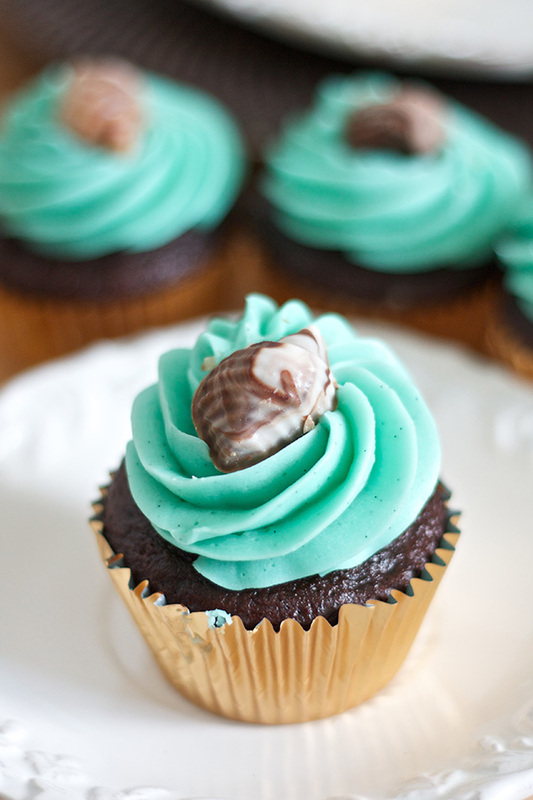 I love these cute, chocolate shells and aqua colored frosting, color is beautiful. 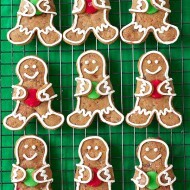 I’ve featured this recipe on my blog, hoping that you don’t mind, but if you do, please contact me and I’ll remove it. All the best.